(CNS): Eight people died after a police helicopter crashed into a busy pub in the city of Glasgow, Scotland, Friday night. The chopper was the same model, a Eurocopter EC135 as that used here by the RCIPS Air Support Unit. A major investigation is now under way and the British Air Accidents Investigations Branch will conduct an inquiry into the crash. Two police officers who were inside the helicopter and the civilian pilot were killed, as well as five people in the bar, known as The Cultha. Another 14 people were hospitalized with very serious injuries. The RCIPS said that this type of accident is extremely rare as the model of helicopter has an exceptional safety record. 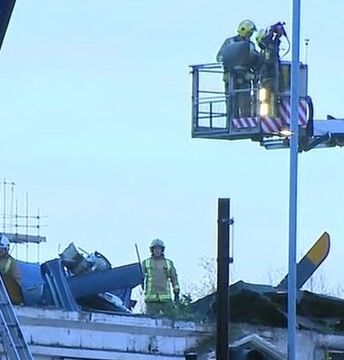 The helicopter crashed into the roof of the pub at 10:30pm UK time on Friday night. It is thought about 120 people were in the pub at the time and most were rescued or escaped but others were trapped by a collapse on the left-hand side of the building. William Byrne, 45, from Coatbridge, who was in the pub when the helicopter came down told the BBC, “There was a loud bang. Then there was dust and the lights went out. It was surreal. We didn't know what had happened. At our side of the pub at least two people were trapped under the gantry. Myself and others lifted it up and managed to get them out. I spent some time with one injured man." Helicopter operator Bond Air Services said it was working with the police and emergency services to find out how the Eurocopter EC135 came down, which will also be of particular concern to the RCIPS. Joining with policing services throughout the world in sending condolences to those involved in the crash, a police spokesperson said the RCISP would be informed about the cause. “This type of accident is extremely rare and this particular model of helicopter has an exceptional safety record. The RCIPS is in direct contact with the manufacturer and as soon as the cause of the crash is known that information will be made available to us. "Safety is of paramount importance to the RCIPS and we will continue to monitor the situation closely and take any required action. In the meantime, the RCIPS helicopter remains operational," the police stated. However, according to another report in the UK's Daily Mail on Saturday, the same model of helicopter t was grounded last year amid safety concerns. Safety regulators had issued an emergency alert over the Eurocopter EC135 after a fault was found on an aircraft used by the Scottish Ambulance Service. The helicopter had been found to have a crack on a rotor blade – a problem which experts said could cause it to crash. It led to air ambulance operators across the UK grounding helicopters as a ‘precautionary measure’, although they were later cleared to fly.